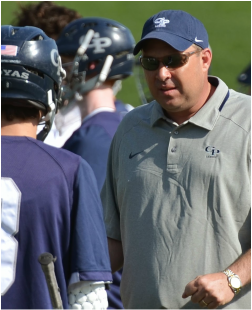 Only the third head coach in Georgetown Prep Lacrosse history, Charlie Horning takes over at the helm after serving as the Hoyas' offensive coordinator that last three seasons. Coach Horning has successfully mentored the Prep offense to give it a dynamic, multi-faceted look and developed players like Charlie Horning Jr., the 2014 Washington Post Player of the Year, Townsend Brown (Virginia), Brendan Collins (Notre Dame), Bear Altemus (Princetown), and Tanner Holifield (Colby) among many. Charlie led the NCAA in scoring in 1991 while playing for Mount St. Mary's. Brendan returns for his 14th year mentoring the defense for the Hoyas. A ‘97 Prep grad who went on to captain St. Joseph’s, Brendan has coached several future college stars including All-America Kevin Ridgway, Jake Brems, Jeremy Hirsch, Bray Malphrus, Greg Perraut, and Alex Blonsky to name just a few. His father, Kevin B. Dowd, is a member of the Georgetown Prep Athletic Hall of Fame and coached a school record 771 games over a 34 year career. “Mugsy” has coached the goalies at Georgetown Prep for 12 years, including several future college All-America selections and several other college starters. He played his college lacrosse at Washington College. Now in his 11th season coaching Prep lacrosse, Ted mentors the face off specialists and wings for the Hoyas who have posted 65%+ win rate in each of his years. A captain at Michigan, Ted’s history coaching at Prep dates back to the early 90’s. A pioneer in the world of lacrosse, Howard brings his experience and knowledge to Prep in this his first year for the Hoyas. Howard has three NCAA National Championship rings from his playing days at Johns Hopkins, besting even his son Josh who won two at Duke, including the 2013 championships. Billy was a four year starter at close defense for the Hoyas before heading to Providence where he was two-time captain for the Friars. Billy also starred at football at Prep as an offensive lineman.